Learn how Leader in Me can help parents and guardians establish a powerful framework to nurture and develop life-ready leadership skills at home. Take the lead at home by teaching and modeling principles of effectiveness for all family members. 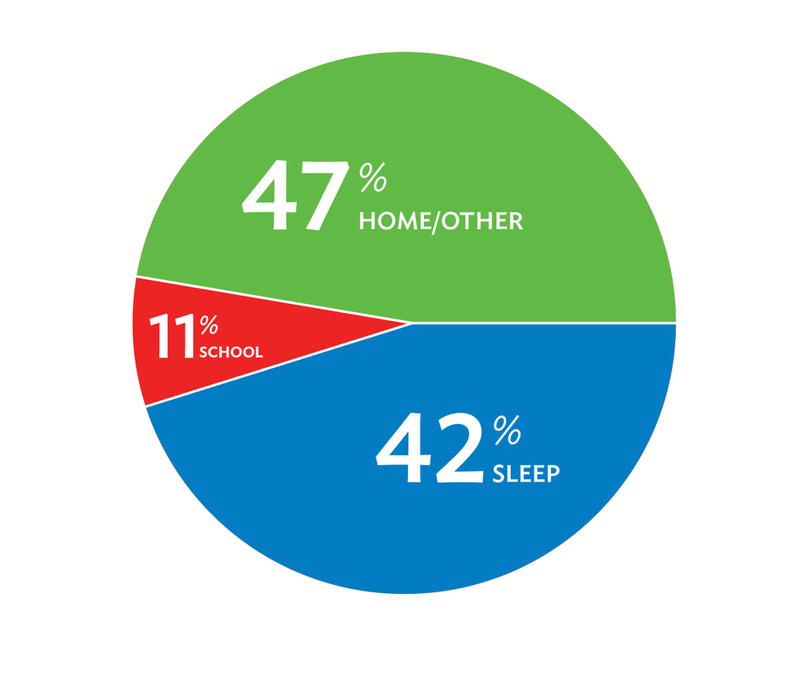 Over the span of 180 days, a student only spends 11% of the time at school (about 943 hours). The majority of his or her time– almost 50%– is dedicated to family life at home and other important communities outside of school). You are your child’s first and most influential teacher by laying the foundation for the education of their mind, heart, body, and spirit. No matter what is going on at school you can help your child discover the leader within themselves and prepare for a future of contribution and service. Even if you have a school that already supports the principles laid out in Leader in Me, your job is no less important. Instructional Hours – US schools average 943 hours of instructional time in 180 days. If you want to make minor, incremental changes and improvements, work on practices, behavior, or attitude. But if you want to make significant, quantum improvement, work on paradigms. Improve family life by improving the home environment with core paradigms shared by Leader in Me Schools. Parents and children have opportunities for shared leadership. Not: Leadership is for the few. Parents are in charge of all the decisions. We celebrate our differences and focus on each other’s strengths. Not: A few people in our family are gifted. Not: To improve my family they need to change. I can’t make a difference. Not: Parents control and direct a child’s learning. Not: Only help children achieve academically. Leader in Me Schools support families by sharing a framework of timeless principles to help nurture and develop life-readiness skills in children and teens to be successful at school and in the future. Leader in Me is a K–12 whole-school improvement model and process that helps educators and families collaborate together to develop students as life-ready leaders. As administrators and staff work to grow a leadership culture at school, parents and guardians can reinforce what is being taught at home with shared paradigms and principles. The result of a partnership between home and school will be students who are prepared for college, career, and life. Get started with several free, simple exercises to integrate 7 Habits principles at home. The Leader in Me Parent’s Guide is based on the timeless principles found in The 7 Habits of Highly Effective People and Leader in Me. This introductory guide shares easy-to-understand ideas and activities and a reading list to help you teach and model powerful 7 Habits principles to your children and teens at home. Read and implement timeless principles of the 7 Habits to improve family relations at home. Experience a practical and philosophical guide to solving the problems–large and small, mundane and extraordinary―that affect all families and communities. 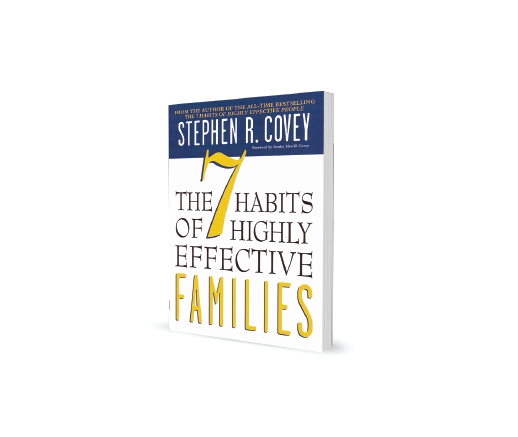 By offering revealing anecdotes about ordinary people as well as helpful suggestions about changing everyday behavior, The 7 Habits of Highly Effective Families provides a powerful framework and set of tools that create an open and inspiring home culture. Learn how to model principles of effectiveness as a family by balancing individual needs and moving from dependence to interdependence together. Improve family relations by establishing effective paradigms and behaviors. 7 Habits of Successful Families training provides parents or guardians a chance to develop a deeper understanding of how to implement the principles and practices of the 7 Habits in a home environment. Parents can either attend a live workshop delivered by a Leader in Me School or become certified to teach other families in the community. Would you like to enroll your child in a Leader in Me School? There are thousands of schools located across the globe in more than 50 countries worldwide. Use the Leader in Me School mapping tool to locate a K-12 school near you. 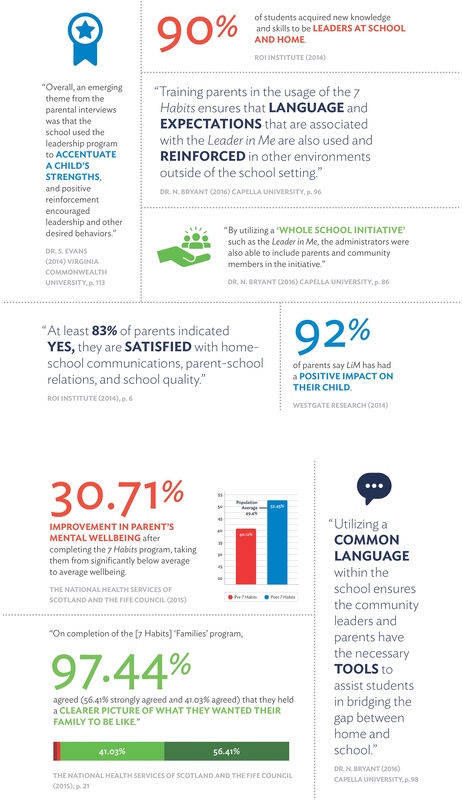 What has been your experience with Leader in Me? Share your thoughts anonymously or request a follow-up consultation to address any problems or concerns. Be sure to explore the FAQ section of the website for answers to common questions. 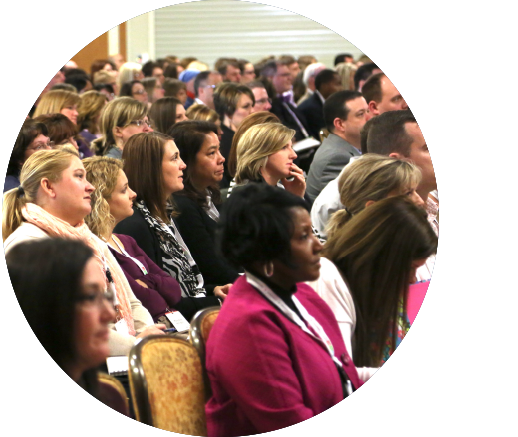 Would you like to see your local school implement Leader in Me? You can proactively introduce Leader in Me to your school or PTA by providing a Leader in Me book or by coordinating with a local FranklinCovey representative.